It is said that any person’s mental attitude is the median of the attitudes of the top five people that he interacts with. It is not surprising that for us to have a positive outlook on life, we need to associate with those who are positive by nature. Likewise even in the path of spirituality, what best way other than to associate with others on the same path? This riveting book about a great soul, Sri Krishnaprem, authored by renowned Bengali singer and musician, and disciple of Sri Aurobindo, Dilip Kumar Roy, brings to light the immense spiritual wisdom of Sri Krishnaprem. Through his close personal interactions with Sri Krishnaprem over about 40 years, in person, as well as through regular written correspondence, the author portrays Sri Krishnaprem’s transformation from an intellectual Englishman, Prof. Ronald Nixon, to a staunch Guru bhakta whose heart became completely filled with divine love of Sri Krishna and Radharani. Why should one have a Guru? Why is it customary to exchange betel leaves on important occasions? Click here to find answers to these questions and more. 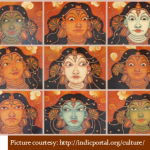 Owing to his deep and complete devotion, the eight goddesses blessed the king that he would be granted their vision whenever he desired. With their blessings, the king ruled the country happily. His kingdom was blessed with every kind of wealth and hence all the citizens were happy and prosperous. December is music season in south India. Let’s test your knowledge about two bhaktas who are famous as Carnatic music composers. Here is an wonderful drawing by budding artist, 8 year-old Purush Sriram from Redding, CA. Children (ages 0 to 18), send us your spirituality/religion-themed original artwork, writings and poetry for publication in our newsletter and website. Email your work to newsletter@godivinity.org. Dec 26, 2011 to Jan 1, 2012: Srimad Bhagavata Saptaha Utsav at Houston Namadwaar (3642 Bailey Ave, Manvel, TX) in the presence of Ms. Poornimaji, disciple of HH Sri Sri Muralidhara Swamiji. All are welcome! 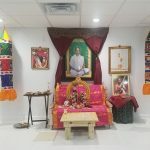 Also please join us for programs all-day, every day, including Srimad Bhagavata parayanam, Mahamantra Nama sankirtan, Devotional kirtans, Divya Nama sankirtan, Children’s programs, Special New Year cultural program and more.